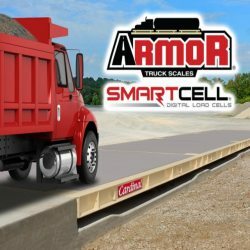 Cardinal Armor series Smartcell digital truck scales have several distinct benefits to you, the customer. First there is the heavy duty weighbridge design the Cardinal Armor digital truck scale uses. For example, the steel deck has (12) 12 inch eye beams across the scale but most important is there’s no moving parts under the scale. With a traditional truck scale, when it comes to debris build-up under the scale, that you typically see in landfills, quarries, sand and gravel businesses; all of that debris can cause problems under the scale and cause binding. Then you will be forced to have folks out there power washing the truck scale, trying to get the scale to work properly because safe linkage systems or load cells that are mounted to piers; the debris impedes on that critical weighing process. This can often lead to down time for cleaning and can also lead to your scale being rejected when being tested by the State weights and measures inspector. Another key element of the Cardinal Armor digital truck scale is simple connections which can also lead to limited downtime. Most important there is no power running to the scale other than the home run cable, that’s very important. Do you know what lightning, rain, and snow can do over time to the junction boxes of a traditional truck scale? There’s over a hundred and eight connection points in many standard analog truck scales.